Last year, when I first moved out to New York to join Erlend, I told myself that we would take advantage of living out on the East Coast. It was closer to Europe; think of all the budget flights we would be able to catch for long weekend trips! Plus there was the whole New England region that I hadn't explored since I'd biked across the country many years ago, and Southern cities like Nashville and Charleston that are much closer to New York City than anywhere from the West Coast. We got this. Of course, that didn't happen. With the exception of a much needed vacation to Portugal (which, quite frankly, only happened because I had a free credit card/air miles situation that was expiring in a few months), both Erlend's and my schedules were far too busy to allow for anything else. The year went by, and I found myself moving back to Portland unceremoniously and plunging solo into house repairs and remodelling. Oh, and my book. But as fate would have it, the moment I moved back to the West Coast, several opportunities popped up that enabled me to have the East Coast travels that I'd dreamed of nearly a year ago. With Stonewall Kitchen (one of the past sponsors of my blog), I took a lovely overnight trip to Maine full of lobster rolls, stunning views of rocky beaches and beautiful New England houses on cliffs, and of course, lighthouses. I then stopped in Boston, where I was schooled by a hotel pastry chef on how to make macarons and had a wonderful, mini-reunion with two old high school friends. As we ate lots of pasta, drank lots of wine, and talked about how lame all of our high school exes were, I deeply regretted not being able to see both of them more often. And then there was my week with Vermont Creamery, in which our lovely hostesses drove a wonderful group of bloggers and myself all around Vermont to tour farms, cideries, chocolate factories, and more — it was impossible not to fall in love with its quiet, rural beauty. Today's recipe is a tribute to my New England travels, of sorts. 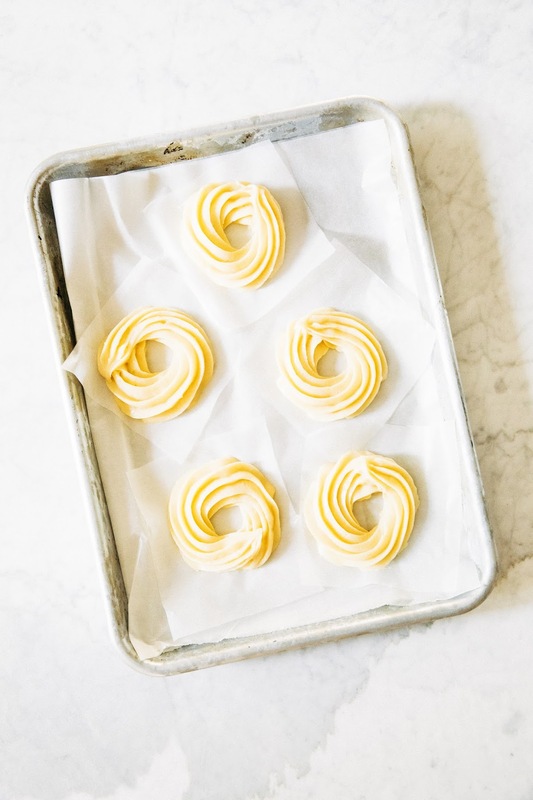 For years, I'd wanted to make crullers after seeing them on an old school cooking blog, Use Real Butter. My first attempt many years ago was terrible—I didn't have the right pastry tip and wasn't as confident in my piping skills as I am now—the crullers came out shriveled and sorry. I vowed to make them again one day, but then found myself living in tiny apartments in both San Francisco and New York that would have caused all my clothes to reek of deep fried oil had I attempted deep frying anything in their kitchens. Fast forward to now: years of pastry piping experience under my belt and my somewhat more spacious kitchen in Portland afforded no excuse. So here we are. Classic crullers, but with an apple cider glaze vaguely inspired by autumn and my New England travels. Enjoy! I mentioned this in the post, but you will need to use a piping bag and the right tips in order to make the crullers of your dreams. I used a large star tip from this Ateco set, which I highly recommend as I use it for everything (but really, a star tip from any large decorating tip set will do). The process for making crullers is weird, and a little on the high maintenance side. Basically, you pipe a circle onto a square piece of parchment paper, let it fry for a bit, and then pull off the paper with a pair of tongs. There's no way around this — the paper helps keep the crullers' shape, and forgoing it will result in churros rather than crullers. They'd be just as tasty though, so go for it if that's your jam. Contrary to popular belief, you don't need a deep fryer to deep fry things. I like to use my trusty Staub cocotte, which has a heavy bottom and thick sides to help retain the heat. In a pinch, a cast iron skillet would work too, but watch out for oil splatters since its sides are considerably lower! The first time I made these, the crullers looked beautiful when I first pulled them out of the oil... only to deflate sadly within a few minutes. Turns out I was severely undercooking them. Pay attention to the temperature of the oil in the recipe — too hot and your crullers will get brown too fast, causing you to pull them out too early and leading to deflation. Too cool and your crullers will get too soggy and oil laden. The perfect temperature and cooking time is in the recipe and will help prevent these problems! Combine 1 cup water, 6 tablespoons unsalted butter, 2 teaspoons granulated sugar and 1/4 teaspoon kosher salt in a medium, heavy-bottomed sauce pan. Bring to a boil over medium-high heat, and add 1 cup all-purpose flour all at once, stirring until the flour is incorporated and the mixture is thick and pale yellow. Continue cooking over medium-high heat to get a much moisture to evaporate from the dough. A thin gluten coat will form along the bottom and sides of the pan. When enough moisture has evaporated, the dough will steam and the cooking flour will smell slightly nutty. To help facilitate this process, try and methodically smear the mixture across the bottom and sides of the pan. Immediately transfer the mixture to the bowl of an electric stand mixer fitted with a paddle attachment. Beat on medium speed for about 1 minute, releasing some of the heat from the cooked dough. Add 3 large eggs, one at a time, only adding the next egg when the first one is fully incorporated. Stop the mixture between each egg addition and scrape down the bowl. Add 2 large egg whites, one at a time, until fully incorporated. The final mixture should be glossy and thick, holding its shape a little bit when picked up with a spoon but still just pourable. Transfer to a piping bag with a 1 1/2-inch star tip and set aside. Prepare your deep frying vessel (see baker's notes) by pouring at least 2 inches of oil into your vessel of choice and attaching a deep-fry candy thermometer to its side. Preheat the oil to 370 (F) degrees. While the oil is heating, take the parchment paper and cut at least 18 parchment paper squares around 4 x 4-inches large. Lightly brush each square on one side with vegetable oil, before piping a 3-inch circle of dough on each one of the squares. Once the oil has preheated, carefully place one of the circles of dough, paper-side up, into the hot oil. 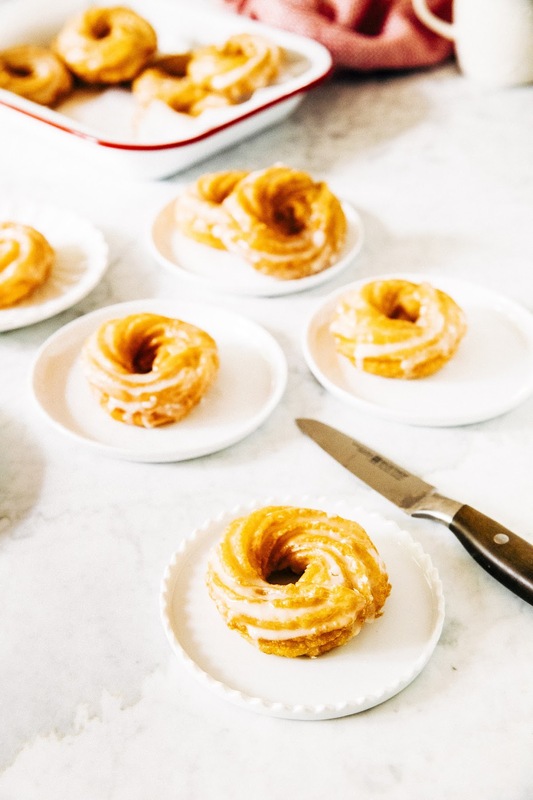 After a minute, use tongs and a sharp knife tip to gently peel the parchment off the cruller. 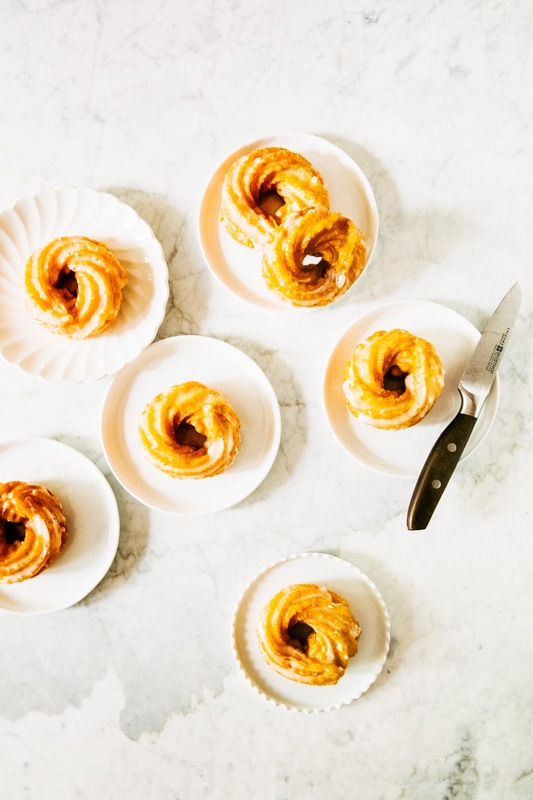 When the cruller turns golden (about 2 minutes), flip it over and let it fry for another 2 minutes before removing it to drain on a cooling rack or paper towels. Repeat until all dough circles have been fried — depending on your deep frying vessel, you can probably fry up to 2 or 3 crullers at a time. Just make sure that your oil maintains its temperature at 370 (F) degrees. 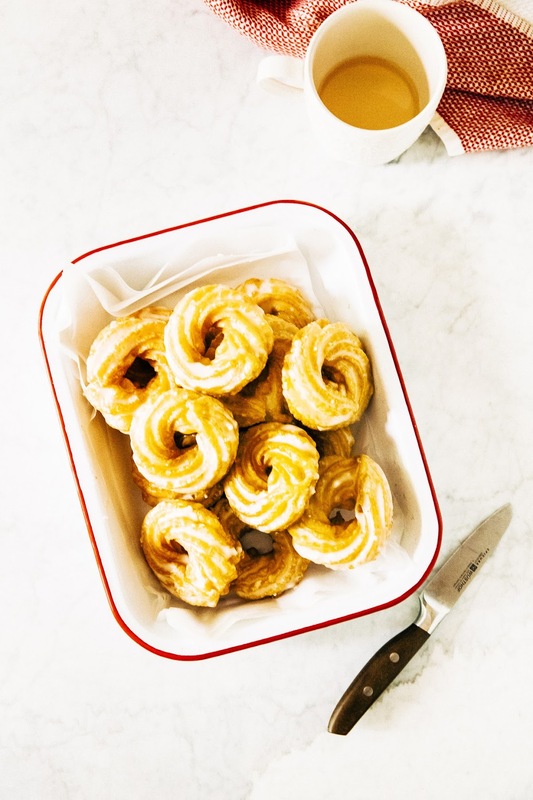 When the crullers are cool enough to touch, whisk together 1 1/2 cups confectioner's sugar, 1/4 cup apple cider, 1 teaspoon honey, and a pinch of ground cinnamon in a medium bowl until smooth. Depending on the weather, you might need a touch more liquid — feel free to add a few extra teaspoons of cider until you get the desired consistency for a glaze! 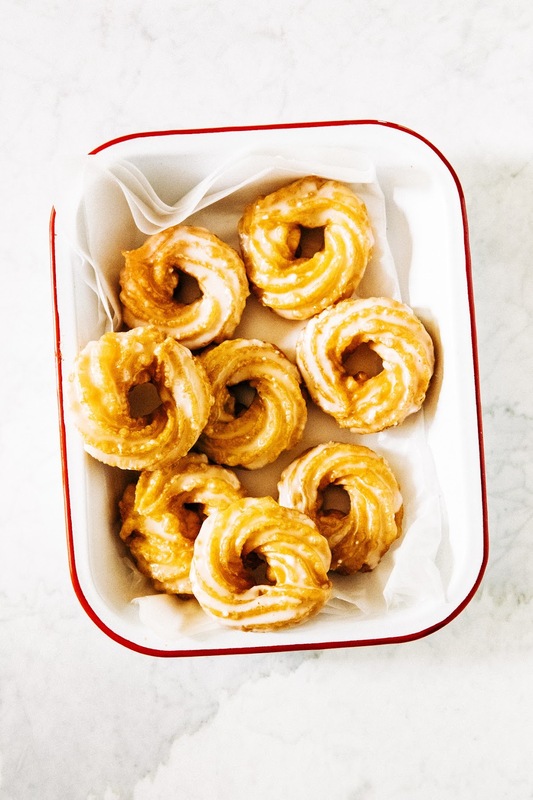 Dip the top of each cruller into the bowl of glaze and set on a wire rack to let the drips run off. When the glaze has set, the crullers are ready to serve.